Teri University, New Delhi is offering one year LLM programme with specializations in (a) Environment and Natural Resources Law; and (b) Infrastructure and Business Law. 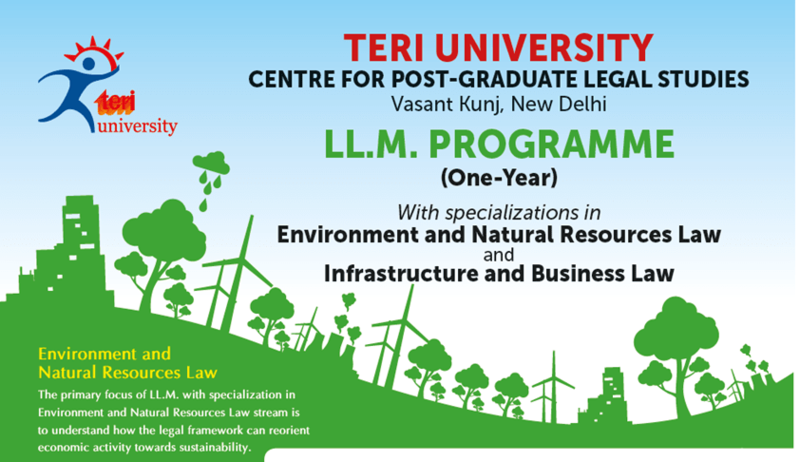 The primary focus of TERI University LLM with specialization in Environment and Natural Resources Law stream is to understand how the legal framework can reorient economic activity towards sustainability. TERI University LLM with specialization in Infrastructure and Business Law will address the policies and laws relating to major sectors viz., transport (including railways and civil aviation), energy, telecommunications, urban infrastructure, and water. Courses designed in consultation with industry and focussing on national and international developments. Courses aimed at balancing theoretical rigour and practical application. Skills development through research assignments, group-works, and seminars. M. degree prepares a candidate to become a teacher, researcher, litigating lawyer or a corporate lawyer. An inter-disciplinary perspective is required at this level and the course curriculum and pedagogy offered by TERI University correspond to the needs of such an interdisciplinary learning. TERI University has been offering courses in law in various programmes over time. In addition, a number of short term programmes in law have been successfully organised in the recent past. The research projects at TERI and TERI University have focused on legal issues in an interdisciplinary setting. These reports are good starting points for classroom discussions. Selection Process: Admission to the LL.M. programme is made on the basis of an all India online test and interview of shortlisted candidates. Application deadline: The last date to apply is May 7.